......There's a wide variety of music to choose from. No bookings required, just turn up. Most Thursdays (and on some other days too) during the summer you'll find free music on the outdoor stage. ........I think it's just great that a city has free events like this. They're meant to be top bands too. It's an outdoors event though so concerts are subject to weather permitting. ........They're a Victorian non-profit youth music organisation and having seen a number of the bands I can assure you they provide some good music. 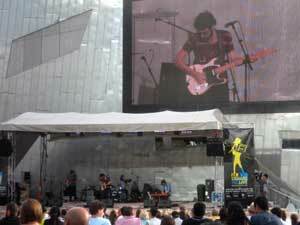 Also at Fed Square you can hear anything from classical, swing, big band, jazz and contemporary pop music. These performances are held undercover in The Edge at Federation Square so there's no need to worry about the weather. They play once a month all year long on the first Monday of the month between noon and 1pm. No booking required. Just click on Classics at Fed Square to see the schedule or call (03) 9655 1900. Check out where Federation Square is in the map below.